I’ve been to a couple of runway shows lately – not NY Fashion Week, mind you, but FIDM’s Gala 2010 and a couple menswear’s shows. And it suddenly occurs to me that menswear is kind of limited. It’s not like they have dresses or skirts to play with. Granted, the occasional Scot or non-Scot is brave enough to wear a kilt, but for the most part they’re dealing with pants, shirts and jackets. Especially in these days of business casual when wearing a tie has become an occasional toil or an homage to “Mad Men.” Men’s shirts are a lot simpler than women’s, too, so I’m beginning to understand why men are so obsessed with jackets and shoes. I mean, what else do they have, really? I feel kind of bad now that I used to give my ex-boyfriend such a hard time about how many jackets he had. Every time we shopped and he drifted over to the jackets, my eyes would begin to roll and my concern for his lack of closet space would eke out as “Really? Another jacket?” Rich always had, and still has, excellent style. Those jackets, and his enormous collection of cool sneakers, were his main creative elements. Sorry, Rich. I get it now. I still say you have a LOT of black zip-up, fitted jackets, though. 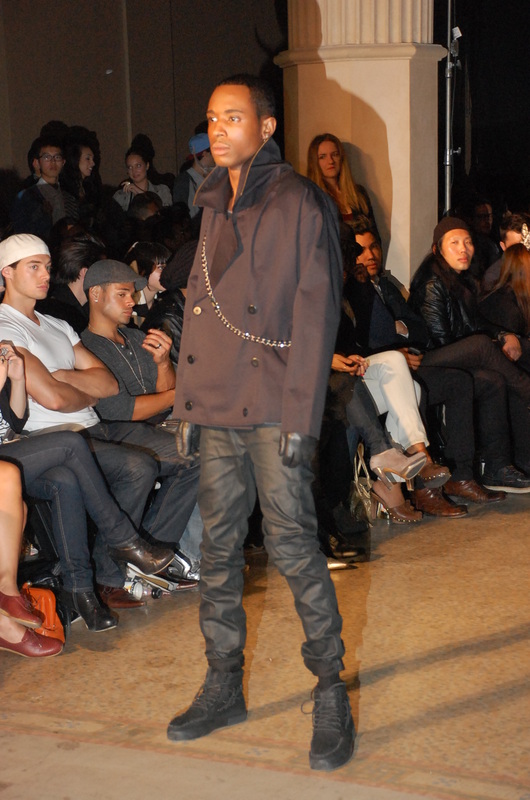 I saw Brandon Scott’s Winter 2010 runway collection downtown the other night. I loved his theme –I THE AMERICAN STRUGGLE. God knows we’ve all been struggling a little lately. I also dug his style. The jackets had great shapes and great detail. Tailoring, tucks and trim and what I can only assume was bike-messenger-inspired cross-chest chain details. If I was a stylist, I’d be looking for an excuse to use some of his clothes in my next assignment. I could definitely see Eric Northman on HBO’s “True Blood” rocking some of the cool jackets with intimidating attitude. And I bet Alexander Skarsgard would love that double-breasted cardigan for his off-screen wandering. 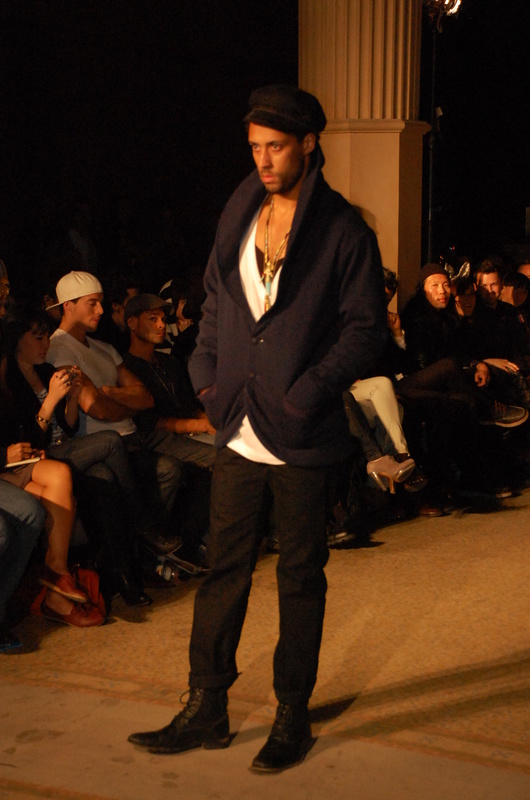 My favorite item was the indigo shawl-collared jacket that made a statement all on its own. In the meantime, great job Brandon. You made me want to be a stylist or a fashion blogger, so I could sit up front and see what cool kicks the models were wearing. Now that I have Kristin’s pics, I can see that they were cool boots. Not much variety, though – if you want something different next time, I’m sure Rich would be happy to make some recommendations.